It started with a long, hard look in the mirror in nothing but biker shorts and a sports bra. Where did that tummy come from? Where did my waist line go?? Oh. My. GOSH! It is June 30th and I have yet to shed my "winter coat," as I like to call it. But what it really is is about 15 pounds of unwanted... fluff? I was once in pretty good shape, but life got in the way. Between work, school, and family obligations it becamedifficult to find time for working out. My weight gain has been so gradual I'd hardly noticed until I tried to put on my once comfy jeans and found they had refused to button. I cursed the dryer for shrinking my favorite jeans, but now it seems the dryer was innocent (sorry, dryer), and I am the guilty party. As I stood looking at myself in the mirror I made a committment to myself. It's time to get my snacking under control and return to the gym! So I took inventory and decided what I need to work on (the tummy, for starters) and set myself a realistic goal. Do I want to look like a Barbie doll? No. I really just be the best me I can be (inside and out). 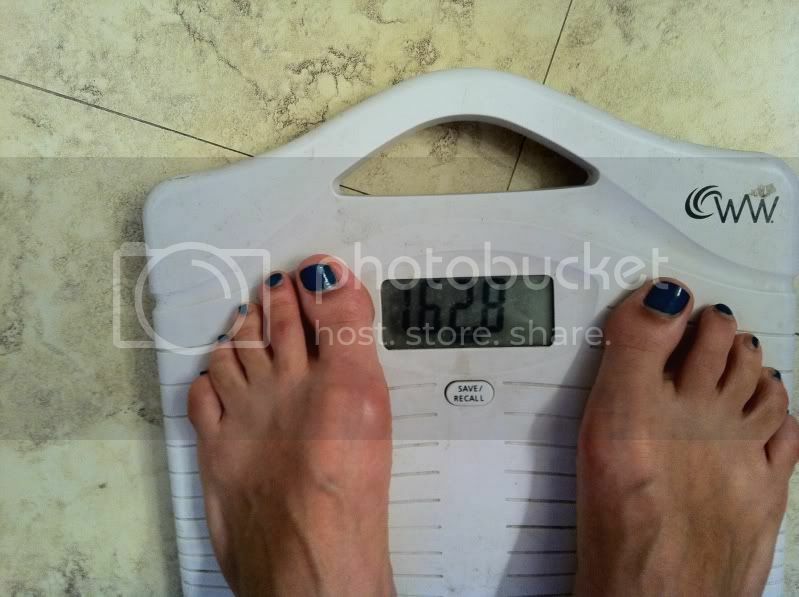 I am hoping to lose 13 pounds and get back into my size 10 jeans. I love the 4th of July for a number of reasons. The barbeques, the fireworks, the patriotism, appreciation for a the men and woman who serve and have served (like my grandfather, uncles, mother and hubby- hooah! ), etc. For me, as with any holiday, I'm always ways looking for fun ways to get festive. Bring on the red, white and blue!! 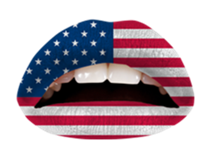 I came across these really cool American flag temporary lip tattoos from Violent Lips. They work pretty much like any other temporary tattoo- but you first shape it to your lips before applying and wetting (here is a video demonstration). They run about $14.95 for a set of 3 on the company website. I also found equally wild Streekers temporary hair coloring in red and blue at Ulta. I've used these before and liked them. I have brown hair but the color shows up pretty nicely. They wash right out with any shampoo so go ahead and be wild for one day. You can also get these directly from the company website (but they won't arrive by the 4th- sorry). They sell for $10.95 each. How are you expressing your American pride this 4th of July? Ahhh... Summer is finally here! Recently, Snapfish launched an exciting summer campaign called “Color Your Summer.” Every week, for seven weeks, they will introduce a feature color on www.snapfish.com/coloryoursummer. Visit the site and upload a photo representing the color of the week for your chance to win. I realize I'm a little late to the party, but no worries! You can still enter a photo for any color that has already been revealed. And if you enter a photo for each color, you'll get a coupon code for a free 5x7 custom cover photo book from Snapfish! You could also win an HP Mini 110 Netbook, an HP Photosmart e-All-in-One Printer or 8x11 photobooks. AND Snapfish and this L.A. Mama are giving one lucky reader an opportunity to win a $50 Snapfish gift certificate so that you can preserve your favorite summer memories. Subscribe to my email feed (must confirm subscription) on the right to receive updates from L.A. Mama via email and comment here letting me know that you did or already do. This contest ends at 12:01 PM on Friday, July 15, 2011. Three winners will be chosen via Random.org. Good luck to all! 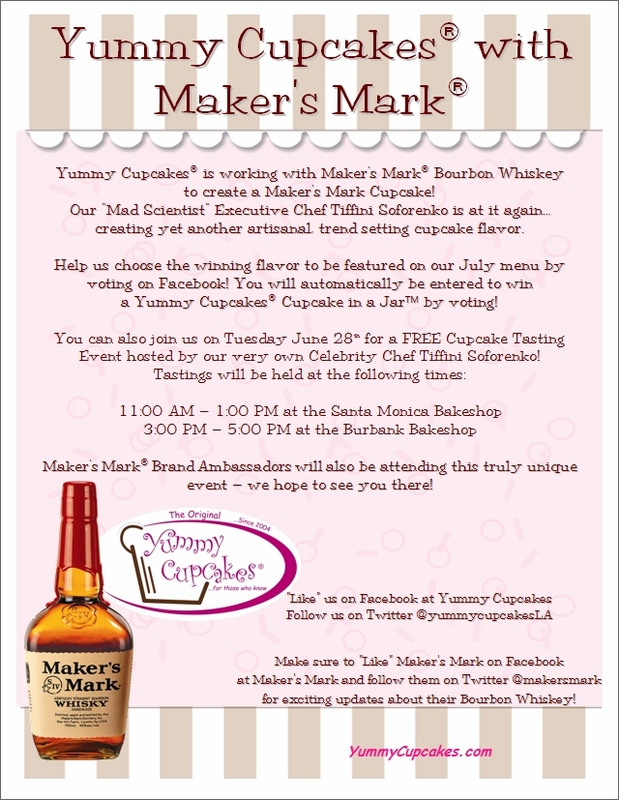 Yummy Cupcakes + Maker's Mark Free Tasting! 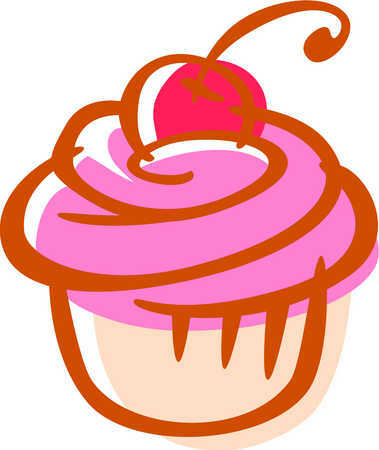 On Tuesday, June 28th, join Yummy Cupcakes as they infuse some of their tasty treats with Maker's Mark Bourboun Whiskey and enjoy a free tasting. Celebrity Chef Tiffini Soforenko will be hosting at the Santa Monica Bakeshop from 11:00am to 1:00pm and at the Burbank location from 3:00pm to 5:00pm. Yum, indeed! Tomorrow is Global Smurfs Day! One of my favorite childhood cartoons is coming to life in a major way next month and I'm too excited! I'm looking forward to taking my kids to see The Smurfs in 3D, but honestly, I'd probably go without them! To celebrate the film's upcoming release and Smurfs creator, Peyo's birthday, Sony Pictures and Columbia Entertainment have declared June 25th Global Smurfs Day! If you're looking for something smurfy to do with the family this weekend, why not celebrate Global Smurfs Day? 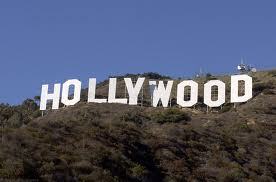 Tomorrow get down to Santa Monica Place from 11:00am to 2:00pm for lots of fun activities to celebrate. There will be coloring stations, face painting, and giveaways and radio station KIIS FM will be there! Santa Monica Place is located at 395 Santa Monica Place, Santa Monica, CA 90401. 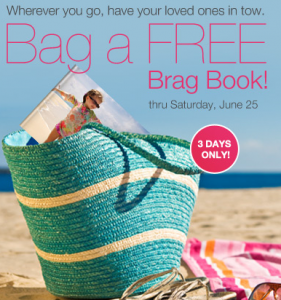 Visit Walgreens’ website to order your Free Brag Book! Just pay $2.99 for shipping and handling (in-store pick-up not available for this deal). The Brag Book is a 4.5” x 6”, 20 page photo book. Choose from over 100 designs and upload your personal photos to make it your own. Click on the “Photo” Tab at the top of the site, then look for “Get Coupon Code” under the Brag Bag picture. Create your Brag Book then enter BRAG at checkout. 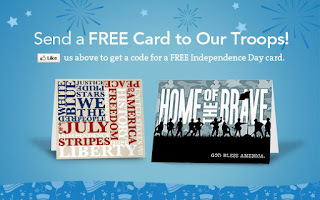 You can personalize a card to have sent to our troops at military bases and veteran hospitals around the world for FREE thanks to Tiny Prints and AMillionThanks.org! 1) To order A FREE Independence Card For The Troops go to Tiny Prints and choose the Forever Flag or American Heroes Greeting Card. 2) Personalize the card with a photo & your text. Blog Giveaway Linky for June 24 to July 1. Add Your Giveaways! Here's how it works: In the "Title" field, briefly enter your blog name, prize, and date your giveaway ends in the form below. Provide the link directly to your giveaway (not your main page). Please do not add spam to this list. Good luck to all! Don't Fret the Sweat Giveaway! Three L.A. Mama readers will each have an opportunity to win a Dove Don't Fret the Sweat prize consisting of go fresh Revive (pomegrante and lemon verbenna) deoderant and body mist and a travel size Burst (nectarine and white ginger) deoderant. There are six ways to enter, but only one entry per method per person. You have six chances! 6) Subscribe to my email feed (must confirm subscription) on the right to receive updates from L.A. Mama via email and comment here letting me know that you did or already do. This contest ends at 12:01 PM on Friday, July 1, 2011. Three winners will be chosen via Random.org. Good luck to all! It's 5:30 in the evening. I pull up to my 10-year-old daughter's school to collect my precious baby girl after she's enjoyed a long day of learning and playing. As I walk through the gates, she sees me and comes running. I smile and reach out to embrace her. She get closer... My expression changes. My precious baby is sweaty and... well... funky! Let's face facts- gone are the days of the sweet smell of Johnson's baby lotion emanating from her sweet skin. While she will always be my precious baby girl, she are now a high energy, active tween. She plays hard. She sweats hard. And her body chemistry is changing. So you can bet I was thrilled to learn of the Dove Don't Fret the Sweat program and couldn't wait to join! The Don't Fret the Sweat program offers all sorts of neat tips, tools, and expert advice for parents and tweens dealing with the very same scenario. One of my favorite features is a the Product Matchmaker which helps you choose a product based on your child's needs and whether they are a boy or a girl, but there are a lot of other great features to explore on the site that help you, as a parent, instill confidence in your tween about their changing body. Dove also has a line of go fresh deoderant and body mists in Revive (pomegrante & lemon verbenna), Energizing (grapefruit & lemongrass), Burst (nectarine & white ginger) and Cool Essentials (cucumber & green tea). After exploring the Don't Fret the Sweat site together with my daughter, she had fun choosing her own scent, settling on Burst. She felt very grown-up having her own deoderant. I felt good being able to arm her with information and a nice boost of self-esteem. I received a Dove Don't Fret the Sweat sample pack courtesy of She Speaks & Dove. I was not paid for participation. The opinions expressed are my own. Cars 2 Event at The Americana! It's almost time! Today, join KIIS FM and Manny on the Streets as the cars from Cars 2 invade the Americana at Brand. Play games and win prizes today from 12:00-7:00pm. I'll be there! Will you? The Americana is located at 300 South Brand Boulevard in Glendale, California. I didn't know my father growing up which always left me curious and longing. Recently I decided to really search for him and any siblings I might have. My search lead me to a small town in Texas, about a thousand miles away where I also have a stepmom, little sister, little brother, older brother, sister-in-law, two neices and a nephew. Wow! I couldn't wait to meet everyone. There was nothing left to do but plan a road trip. When I was a kid I took more road trips with my grandparents than you can shake a stick at, so I'm no stranger to the open road. I remember stopping at what seemed like every roadside attraction along the way from California to South Dakota- priceless memories. I was excited about creating these kind of memories with my own children. Mind you, the furthest we have driven with the kids is 130 miles to San Diego AND there are three of them so I would have to be a bit more creative with distractions. My first stop was Target's $1 section where I found these great neck and lumbar pillows ($2.50 each) for the kids to keep them comfortable on the long ride. They came in four fun colors that they had fun picking out. Next I stopped by Whole Foods for some of our favorite snacks. I knew there was no Whole Foods where we were going and I wanted to make sure there was something we would all eat. I grabbed Newman's Own Organics Honey Wheat Pretzels (yum! and pretty mess-free for the car), Eternal Artesian Water (my favorite- the bottles are BPA-Free), Kopali organic dried mangos (we all love these) and fresh fruit to eat. Lastly, entertainment! I loaded up the iPad with family-friendly movies like Gulliver's Travels and Jumanji. We also brought the kids' Nintendo DS handheld games. I love the fact that they link up to one another and play together. But I didn't want them totally imersed in electronics the whole trip so I also took to the internet in search of road trip themed printable games and puzzles to help occupy their time. The best website I found was Mom's Mini Van where I found printable Road Trip Bingo, tongue twisters and some great travel tips by age group. Thanks to great planning, the trip was a success! We drove straight through in about 18 hours each way (including stops to gas up). There was mininal backseat bickering which made the trip that much more enjoyable for my husband and I. We had a great time meeting the family and would definitely do it again! Take the opportunity to stretch and excercise when you stop for gas. We may have looked a little silly doing jumping jacks on our breaks but it got the blood flowing which helped keep us awake and also kept us from getting cramped muscles. Do use online tools like Gas Buddy to estimate the cost of fueling your road trip ahead of time, and Yahoo Maps as a backup for tech tools like iPhone Maps. I experienced a problem with roaming around New Mexico that made me feel hesitant to use AT&T data services so I was glad we had a hard map to rely on. Nail Files is a new reality show that follows high-energy salon owner, Katie Cazorla. Nestled in the heart of Sherman Oaks, California, Katie's salon, The Painted Nail, caters to A-list celebrity clientele from Vanessa Williams to Vanessa Hudgens. Watch she juggles the task of running the salon, growing her "eco-chic" nail polish line and her relationship with her music producer fiancé, Walter Afanasieff all with the help of good friends and an equally charismatic staff. 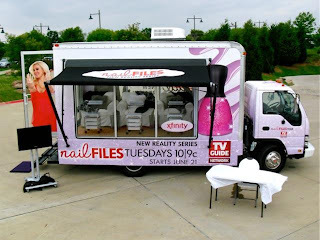 Viewers can get a taste of luxury on the Nail Files mobile spa tour where they will enjoy a preview of the show and receive complimentary salon services (and possibly meet Katie herself). Visit the the Facebook site for tour schedule and locations. Nail Files premieres June 21st at 10:00pm ET/PT on the TV Guide Network.